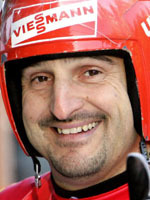 By winning the singles luge event at the Winter Olympics in 1992, 1994 and 1998, Georg Hackl became only the sixth athlete to win the gold medal in the same discipline at three consecutive Games. However his fourth straight Olympic triumph escaped him in Salt Lake City as his great rival Armin Zoggeler of Italy won a tense duel, with Hackl settling for silver. Adding that silver to his collection made him the first athlete at either the Summer or Winter Games to win a medal in the same discipline at five straight Olympiads. He hurtled down a track for the first time as a fearless 10-year-old, and by the time he was 22 had his first major win under his belt, the 1988 European championship. Without the lightning-fast start that other competitors can achieve he has closed the gap by keeping himself at the peak of fitness and relying on his muscular physique to maintain an aerodynamic position on his sled at all times. As well as his Olympic exploits, he won world titles in 1989, 1990 and 1997 and finished his career with two overall World Cup crowns as well, topping the table in 1989 and 1990. According to his coach Thomas Schwaben, Hackl "runs through every single aspect of a race in his mind, so that when he actually starts his run the most crucial part is as good as over for him. His mental preparation is phenomenal. Psychologists say it could not be better." A locksmith by trade before he joined the army, Hackl is easy-going unless riled. When a daily newspaper referred to him in 1992 as lacking in intelligence, Hackl sued for libel and won. Hackl qualified for the German team and his third place finish in the 2002 World Cup title race confirmed that Hackl was not ready to give up his Olympic crown without a very determined fight. Proving that he's still at the top of the sport he finished second during the World Cup campaigns in 2003 and 2004 and won another silver at the 2004 world championships behind young compatriot David Moller. In 2005 at the world championships in Park City, he finished second for the seventh time at the expense once again of Zoggeler, but ahead of Moller. He fared better in the team event helping Germany to a fifth straight title. He was selected for Turin despite a string of injuries in the 2005-2006 run up season when the German bobsleigh federation declared they were convinced he would make the podium and thereby become the first athlete to win medals at six straight Olympiads. However he could only manage 7th on the Turin track, a disaster by his standards as Zoggeler again took gold. But as he approached his 40th birthday and left the sport for good after 19 seasons, few can argue that Hackl will go down as one of the legends of the luge.